I’ve been eagerly waiting for C.A. Szarek’s sequel to The Tartan MP3 Player and a chance to revisit the world of the Highland Secrets series. 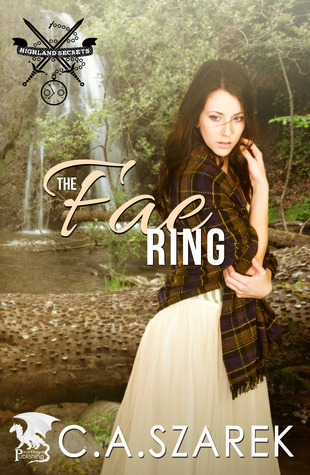 The Fae Ring is book 2 and it’s a delicious mixture of paranormal and historical romance. Janet has been the lady of the castle since her mother died years before. She’s had responsibility and sense of place… but now her brothers are married and she is feeling lost… Where does she fit in now. She is happy for her siblings and their loves but… she is sad at her loneliness too. I empathized with her immediately and ached for her to find a life partner… a mate. Spotlight on Carnal Magic by Lila Dubois + Excerpt + Contest! Check out the first book in The Wraith Accords series, Carnal Magic, and fall for Isabel and Aed. *swoon* I raced through this magical (and HOT!) story. Click HERE for my review. PS. Don’t forget to enter Lila’s contest! *waves down* It’s at the very bottom.